Cadbury's Creme Egg Cupcakes - The best Easter bake! 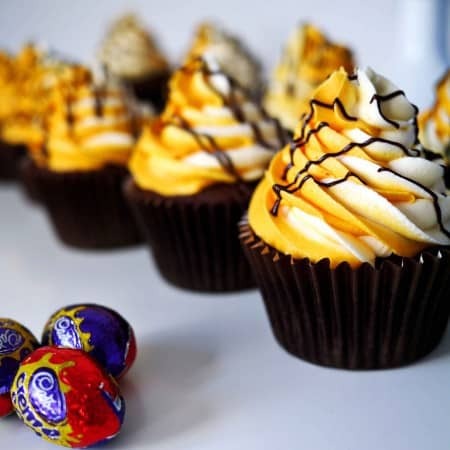 My favourite recipe along with 5 must know TOP TIPS for making the perfect Creme Egg Cupcake. Freeze your mini Creme Eggs for a couple of hours, or overnight. Beat in the eggs one at a time, followed by the vanilla extract, don't worry if the mixture begins to look a little curdled. Mix in the flour and cocoa. If you've been using a mixer, do this bit by hand with a spoon or spatula. Put a spoonful of batter into each muffin case, in a muffin tray. Unwrap your Creme Eggs and place one, laying on it's side, in the middle of each muffin case, on top of the batter. Top with the rest of the batter and with a spoon, gentle move the batter in the cases, so that you can't see any of the frozen eggs and they are totally covered with batter. Bake for about 20 minutes or until they are slightly bouncy to the touch. You might need to adjust the time by 2 – 3 minutes either way depending on your oven. Meanwhile make your icing, beat your butter until it’s pale, light and fluffy. Beat in your icing sugar followed by a teaspoon or two of boiling water to soften and lighten the texture of the buttercream. Split the icing between two bowls and colour one using your Egg Yellow colour. Use just the tip of a knife and add more colouring as you go until you get the shade you fancy. When your cupcakes are completely cold, put your 2D nozzle into a piping bag, then spoon in your white buttercream and your yellow icing. Spoon them in next to each other, so one goes down one side of the bag and the other down the other side. Have a little practise squeeze until you get a two tone icing coming through, then pipe swirls onto your cakes. Melt your chocolate and allow to cool. Pop into a disposable piping bag, snip 2 - 3mm off the end of the bag and use it to drizzle your cooled chocolate in squiggles over the top.